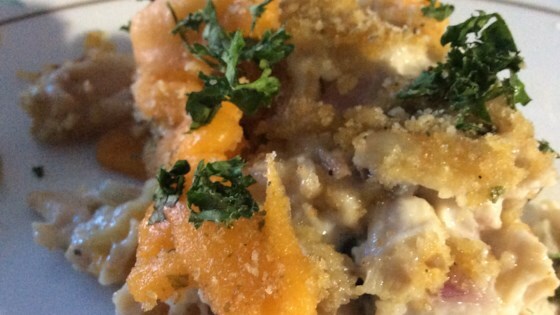 "Delicious and different casserole that can be made with unseasoned pre-cooked chicken." In a large bowl mix the chicken, celery, water chestnuts, mushrooms, mayonnaise, lemon juice, salt, onion, and almonds. Transfer to the baking dish, and top with Cheddar cheese and crushed potato chips. Very rich, but tasty. A great recipe if you have young children or teenagers. i liked this a lot. it disappeared at a covered dish supper recently! i didn't use potato chips for the topping, however. i prefer crushed ritz crackers with butter as a topping. This was excellent, I did add a small amount of cooked shell noodles. The water chestnuts add such a nice crunch. I am not a Mayo fan, so I did use Miracle Whip instead. My kids are 16 and 12 and absolutely loved this recipe. I'll definitely be making it again in the future. I seasoned the chicken quite a bit -- was very good! Excellent...it is. An original...it ain't. This is a wonderful recipe for large groups. I served this to 20 women and they all loved it and they all went home wih the recipe that night.